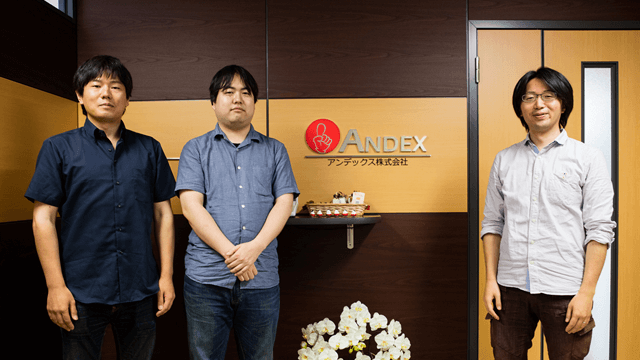 Andex, Inc., a development company located in Sendai, provides comprehensive software services, including proposals, design, manufacture, testing, and operation. Since its foundation in 2009, ANDEX has focused on mobile app development, an area not broadly worked on in the Tohoku district. The company has a policy of regional contribution, and focuses on Fishery X IT (fisheries industry introducing IT). The company employed Xuni in a smartphone app designed for fishermen and developed in the Fishery X IT project. Designed for fishermen, an audience that has been historically reluctant to adopt information technology, Fishery X IT provides dynamic displays, employing animations for charts and incorporating ideas from the field. Andex's goal was to improve the traditional fisheries industry by better data management. Jun Mishima, the president of Andex, Inc., was born and raised in Sendai. 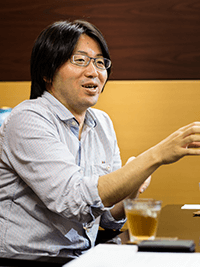 By developing community-based businesses, the company has focused on more than just developing software; Mishima also wants to contribute to the Miyagi Prefecture, their region of Japan. With Miyagi sustaining major damage from the 2011 tsunami, the company set its sights on the fisheries industry. Mishima had worked as a sales representative at a fishery trading company, and his inside knowledge included the challenges fishermen face. He thought that systematization could improve operations, lower costs, and allow consumers to get seafood at a low price— changes that would support the maritime area devastated by the Great East Japan Earthquake. His idea was realized as Fishery X IT (fisheries industry introducing IT). 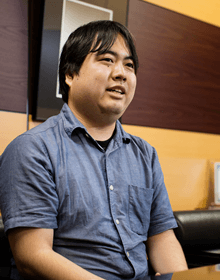 Kousuke Suzuki, who has worked on the project since its kickoff, told the story. "Today, systematization is being driven in all industries except for the fisheries industry... We recognized that it was a challenging project, but we believed that we could revitalize the market and do some good in the community by asking the fishermen about their problems and promoting IT in the fisheries industry." The team began research to develop the project, and met Professor Masaaki Wada, Department of Media Architecture at Future University Hakodate. Professor Wada was working on introducing IT for a sustainable coastal fishery using IoT buoys that could measure water temperature (ubiquitous buoys). With their goals so closely in alignment, Fishery X IT sought his cooperation. During the project, the team was contacted by a representative of NTT Docomo, Inc. NTT Docomo had already been providing support for fishery businesses heavily damaged in the earthquake, and given Andex's similar goals, they decided to develop a smartphone app together: With the data from the IoT buoy, the app helps oyster and seaweed farmers track factors relevant to the growth of their stock. 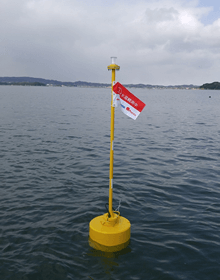 In the first stage of the testing, they accumulated water temperature data from the IoT buoys. Giving the highest priority to data visualization, they developed an Android app that showed the lowest, highest, and cumulative water temperatures. Cumulative water temperatures are used to estimate the time when aquatic organisms spawn. It's calculated by summing up temperatures exceeding a certain level, and when it reaches the reference value—600°C for oysters—it indicates the time of spawning. "The fisherman told us they went out in boats to measure the water temperatures every day so they'd know when the oysters would spawn," said Naoki Takahashi, the Android developer. "This app allows users to view the water temperatures from several buoy locations at a glance. The fishermen can see the water temperatures without taking their boats out, which saves fuel." In the past, the fishermen tracked their water temperature data on paper. With so much data, they rarely had time to review their accumulated daily data, which meant they couldn't research the cause of any lean years. 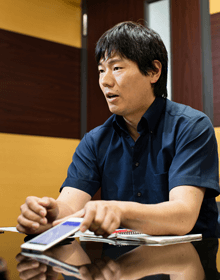 "The ability to get the data from our app now makes looking back easy," Takahashi said. "It also eliminates the time required (to) measure water temperatures, and this frees up time for data analysis." Xuni, a UI control set for the mobile app, helped to visualize the accumulated water temperatures. Takashi added that Xuni was selected because the grids and charts were essential for the app to succeed. Visualizes the cumulative water temperature at the top screen. Displays the accumulated water temperature data with a simple table view. The water temperature of fixed-point observations at a maximum of three places. This provides the most precise water temperature data. Displays the measured water temperature over time at a given location as a series. Visualized as a line chart. While the Android app was being prototyped, they started the development of the iOS version. "The iOS environment does not have default grid and chart features, so we'd have had to create them from scratch," said Yusuke Akaizawa, the iOS developer. "Xuni includes equivalent controls in both Android and iOS, which made it easy for us to make the same screen as the one in Android. In addition, we got quick email support responses and sample sources, helping us to shorten delivery time. "People who are familiar with smartphone apps these days take dynamic displays for granted," Akaizawa said. "They will not accept static ones easily. Xuni's animations, shown at chart display and refresh, saved us many man hours. We could not have created an app of the same quality without Xuni." The true test came with the introduction to their target audience: the fisherman. The Andex team would have to convince the fisherman that data visualization improved the efficiency of tasks that, historically, depended on experience and a feel for the work. The team often visited the fishing grounds and continued to listen to the voices of those others working in the field. The verdict? The fisherman say, "Now, we can see the data we want." And they're even asking for future versions with even more data. "After getting the water temperature data, they now want to see wind speed and direction and wave height. We're currently continuing with additional developments and are also providing proposals based on new features added in Xuni updates," said Suzuki. The Fishery X IT project is just getting started. The team agreed that the project has been an exciting challenge, especially for the IT engineers to work with fishermen in the field. As word of the app spreads, they've been contacted by other regions. The current app covers only Matsushima Bay, but they're expanding the scope and looking to deliver similar data from other locations. Looking to the future of the entire fisheries industry, this project seems natural for Japan, an island country surrounded by the sea. GrapeCity, also based on Miyagi, continues to support the Fishery X IT project, expecting it to deploy from Miyagi to Japan, and in the future, to a global scale.